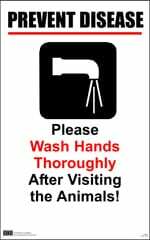 Every year there are ~3,200 state and county fairs in the United States that attract ~150 million visitors. 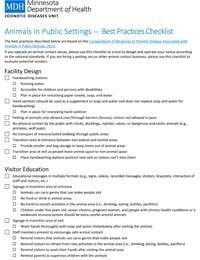 Fairs are great opportunities for people to observe animals, learn about animal agriculture, and experience the human-animal bond, but there is also the potential for human illness and injury at fairs from food, water, and animals. How aware are fair organizers of these risks? 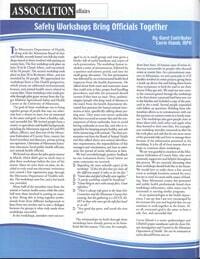 How ready are they to respond if an event occurs? 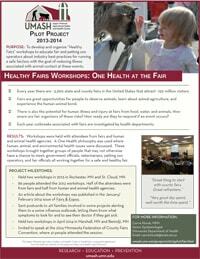 Through a UMASH Pilot Project, the Minnesota Department of Health and Minnesota Board of Animal Health developed the Healthy Fairs Workshops. 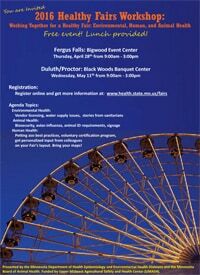 These workshops address issues of environmental, human, and animal health at fairs and petting zoos, and bring together groups of people that may not otherwise have a chance to meet; government officials, veterinarians, petting zoo operators, and fair officials all working together for a safe and healthy fair. 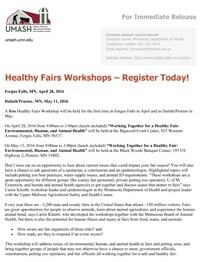 2016 Healthy Fairs Workshops press release. Summary of the Healthy Fairs UMASH pilot project.